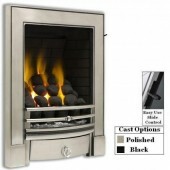 What is a "Gas Hotbox Fire"? 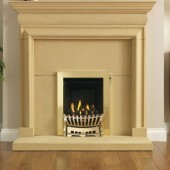 A hotbox is a gas fire, which by its design, delivers a flame effect - combined with heat. 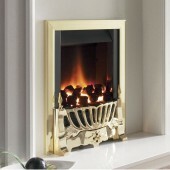 This category of fire typically delivers between 2.5 Kilo Watts and 3.5 Kilo Watts of heat.To explain this heat measurement figure, a 1 Kilo Watt of Heat would be the equivalent of a 1 bar electric fire. 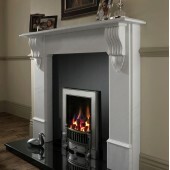 A hotbox has a box built around the flame, which controls heat loss to the chimney, and as a result it delivers more heat to the room than that of a basic "Coal Effect Fire".Hotbox gas fires are generally fitted into a rectangular opening and for this reason are not generally suitable for fitting into a "cast iron fireplace". 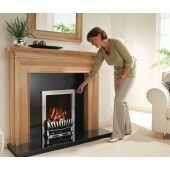 Hotbox Gas Fires-Standard Efficiency There are 7 products. 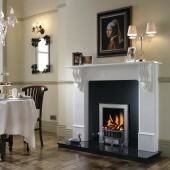 Edwardian Gas Fire, Open Radiant Inset Gas Fire, Polished or Black Cast Iron Frame Ekofire 130803085, Classic and ever-popular Coal-effect or Log effect gas fire, available with cast iron fret and accessorise to suit your interior decor.